besan ladoo recipe | besan ke ladoo | besan laddu recipe with detailed photo and video recipe. one of the most popular homemade ladoo recipe prepared with gram flour or chickpea flour, ghee and sugar. besan ke laddu is prepared especially during indian festival like diwali, ganesh chaturthi and navaratri. 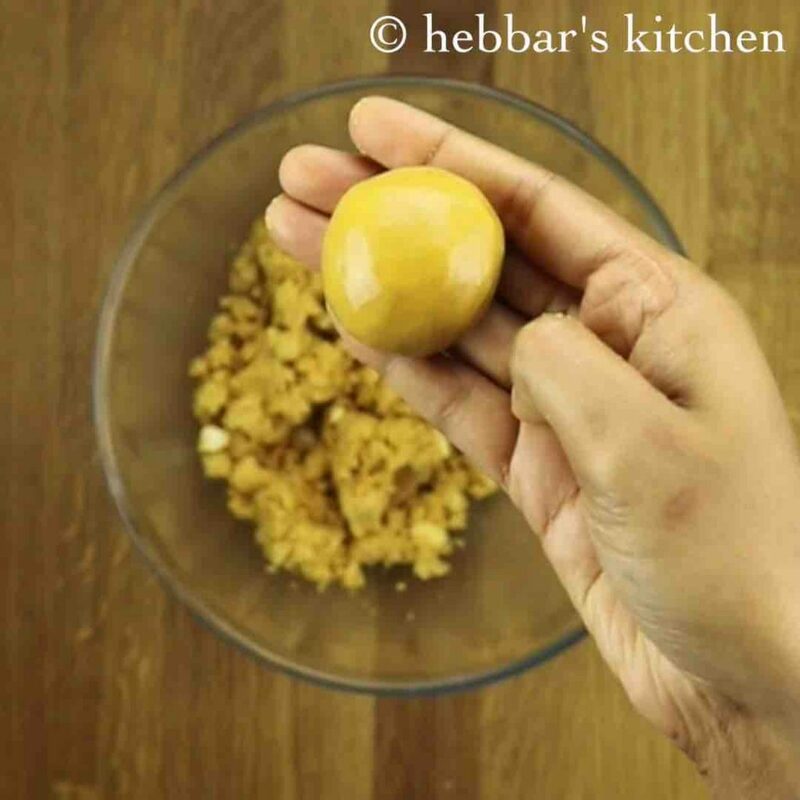 besan ladoo recipe | besan ke ladoo | besan laddu recipe with step by step photo and video recipe. 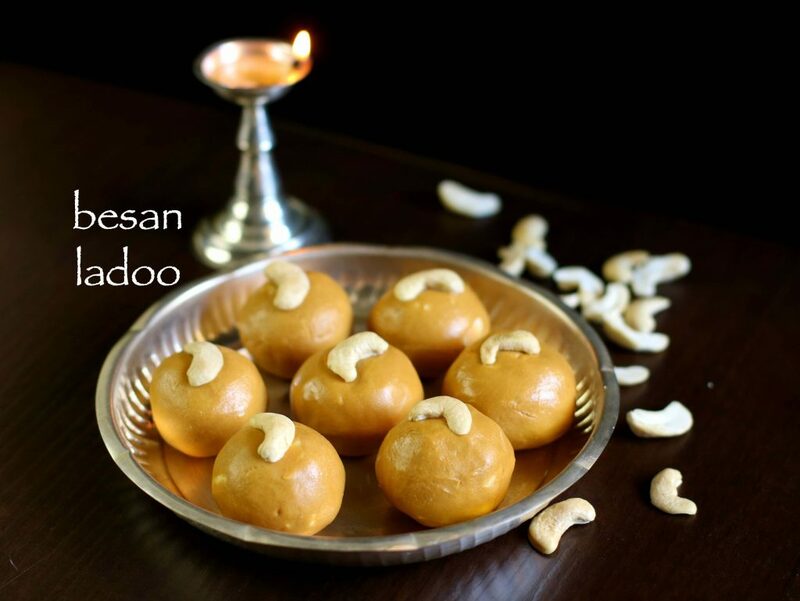 besan ka ladoo is prepared by roasting besan flour in ghee till it turns to golden brown with a nice aroma. then powdered sugar is added with mix of dry fruits and then shaped into round balls. it is typically prepared in indian festivals, family functions or events. i have already shared an easier version of this recipe in microwave. but the traditional or authentic of besan ke ladoo recipe was long due on me. previously i had thought to share this recipe on deepavali, however i couldn’t because of other priorities. well i wanted to release this before next diwali hence i thought it is now right to share this exotic indian sweet recipe. moreover this recipe is shared by my mother and i have introduced some subtle changes to have better shelf life. 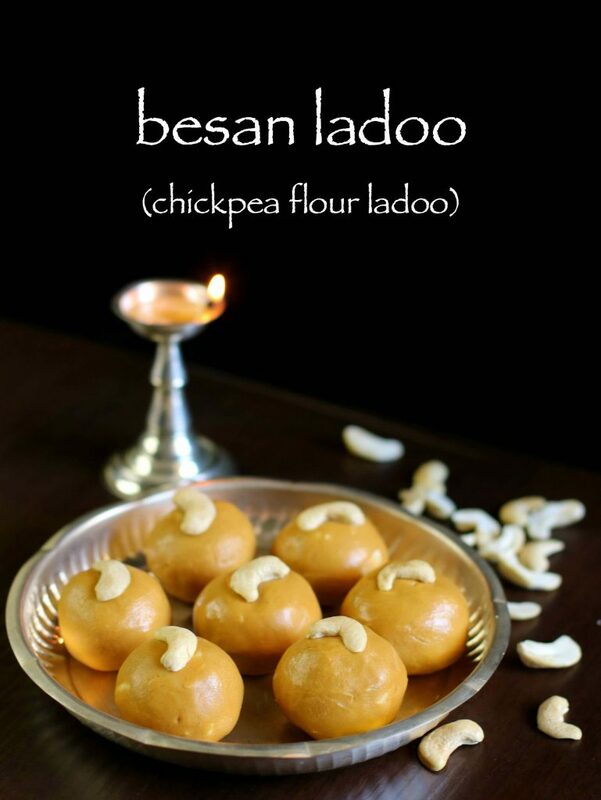 besides, some important tips and suggestions for a perfect besan ladoo recipe. 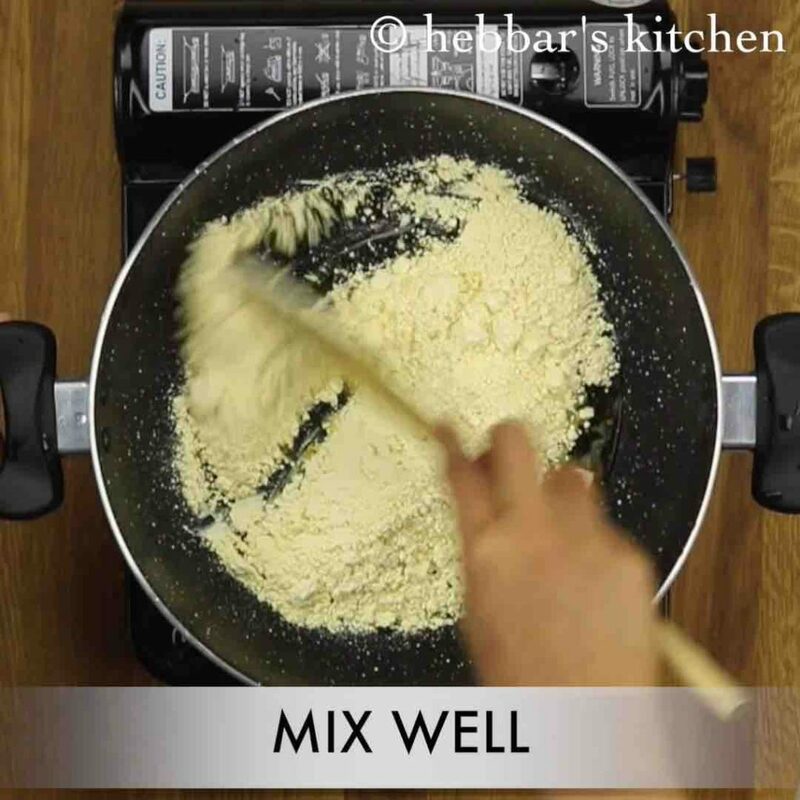 firstly, and more importantly, try to use grainy flour or gram flour as compared to fine besan flour. 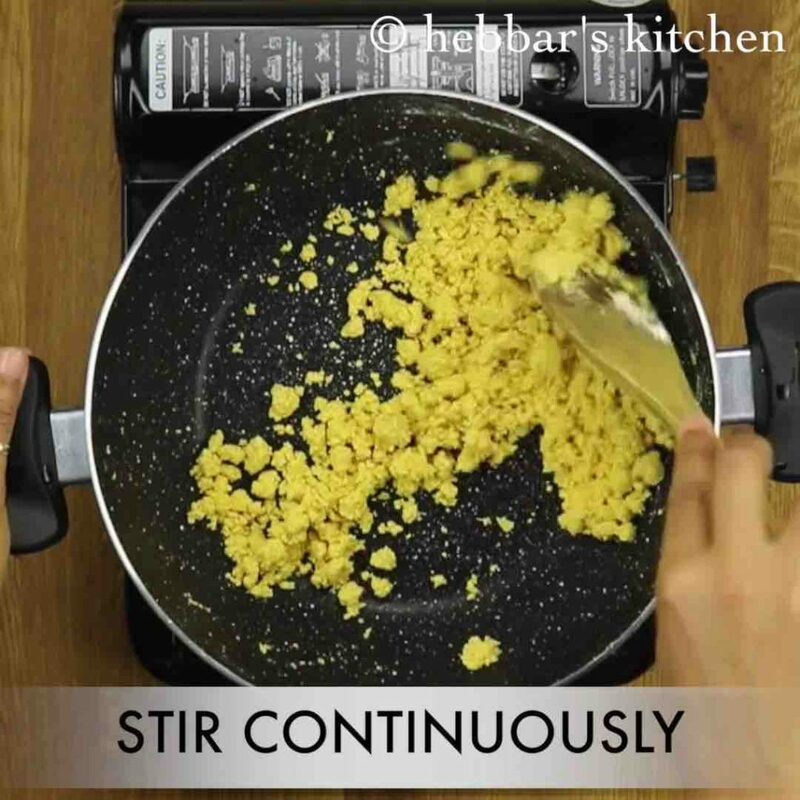 the grainy flour would help to shape the ladoo and also gives crunchy bites. alternatively, you can also add a tbsp of semolina or rava to besan flour which helps to get the same texture. 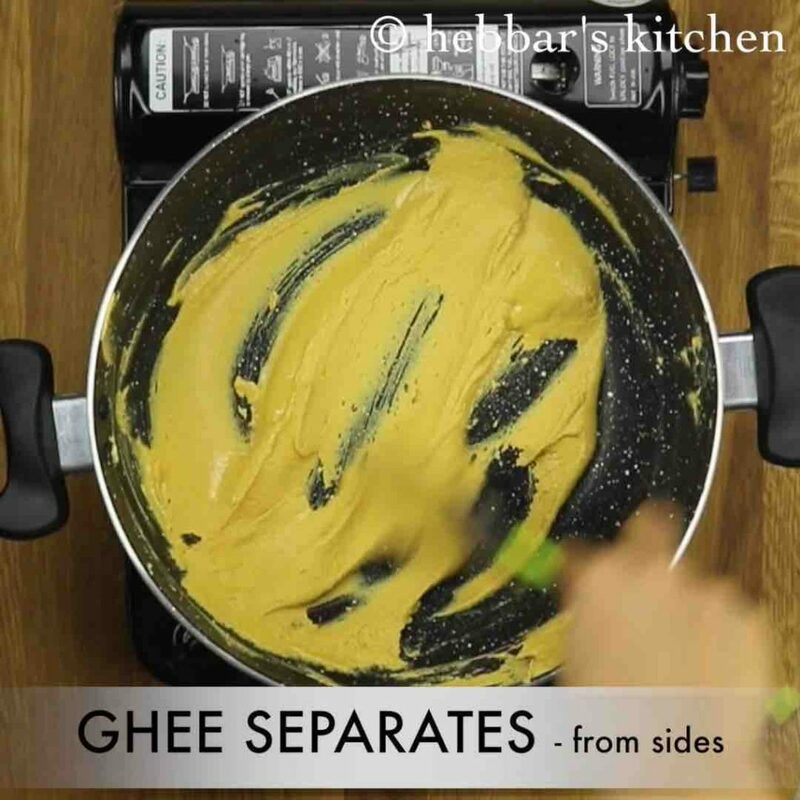 another important tip is add sugar when the ghee + besan mixture is completely cooled down. if you end up in a situation where you cannot form the laduu shape. then refrigerate the mixture for 10 -15 minutes and than try to shape the ladoos. firstly, in a thick heavy bottomed nonstick pan heat ghee. once the ghee begins to melt, add besan. now mix continuously, making sure the ghee is combined well with besan. keeping the flame on low, stir continuously for atleast 25-30 minutes. also break the lumps in between. and stir continuously keeping the flame on low. 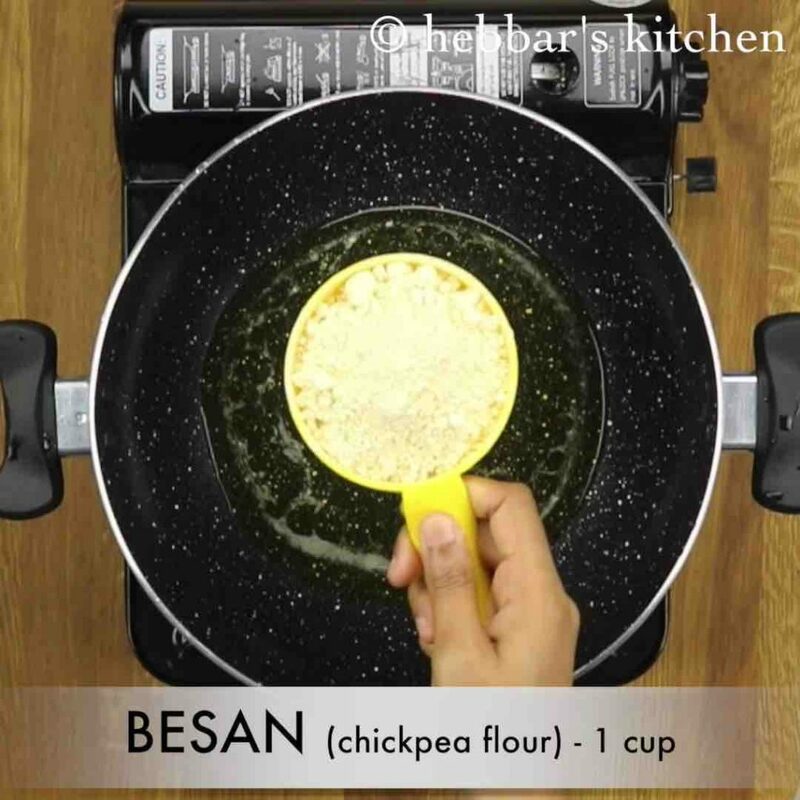 keep stirring till the besan turns aromatic. and also wait for besan to change colour to golden brown. 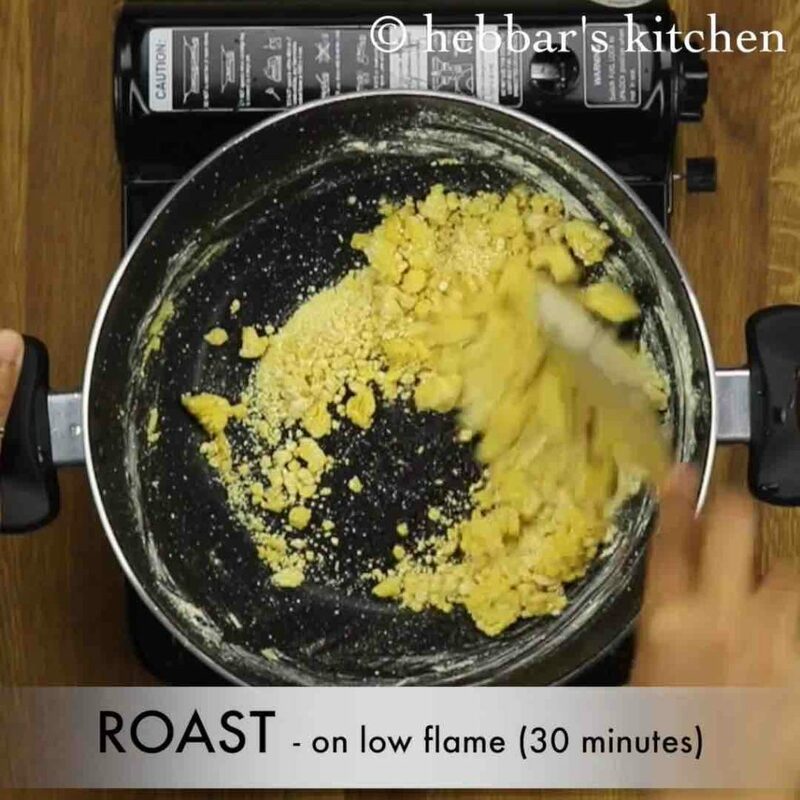 take off the flame and transfer the paste to a bowl. allow the besan paste to cool completely. 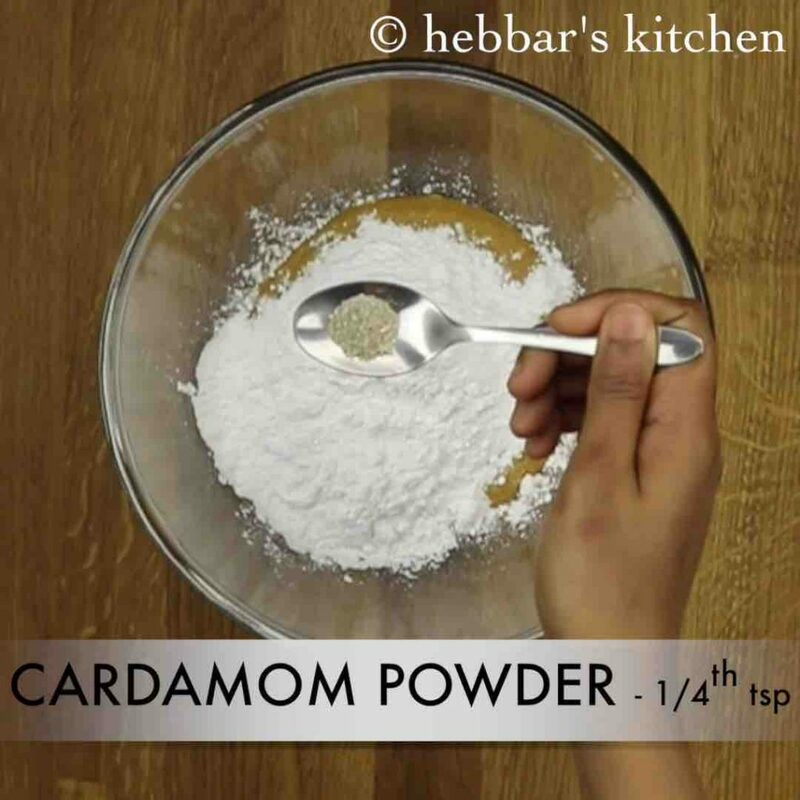 further, add powdered sugar, cardamom powder and broken cashews. 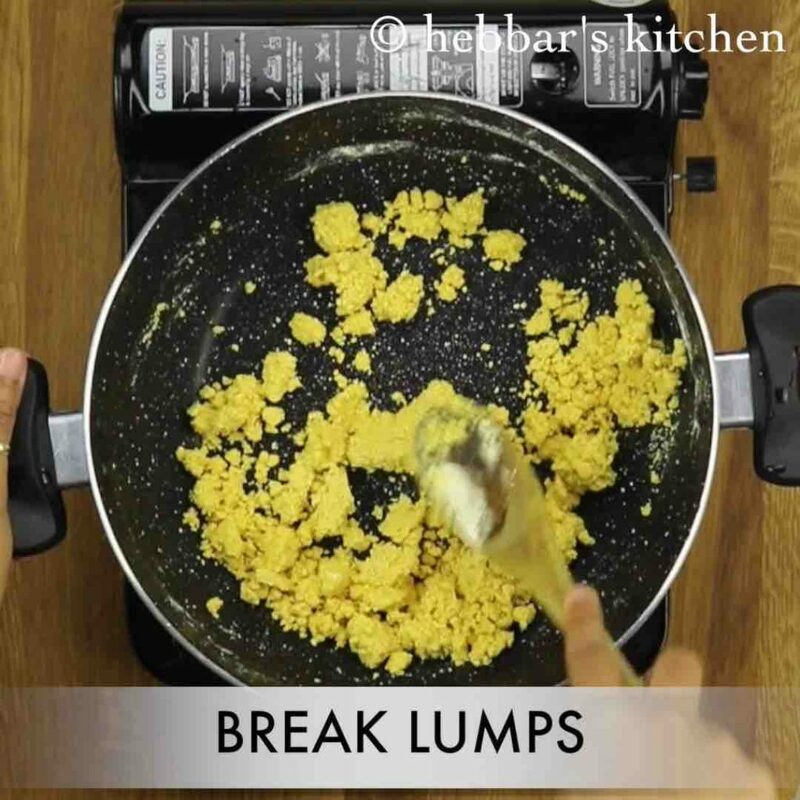 take a tbsp of mixture and prepare ladoo. finally, serve besan ladoo or store in a airtight container. firstly, in a thick heavy bottomed nonstick pan heat ghee. i have added ¼ cup + 2 tsp of ghee to make besan ladoo more moist. 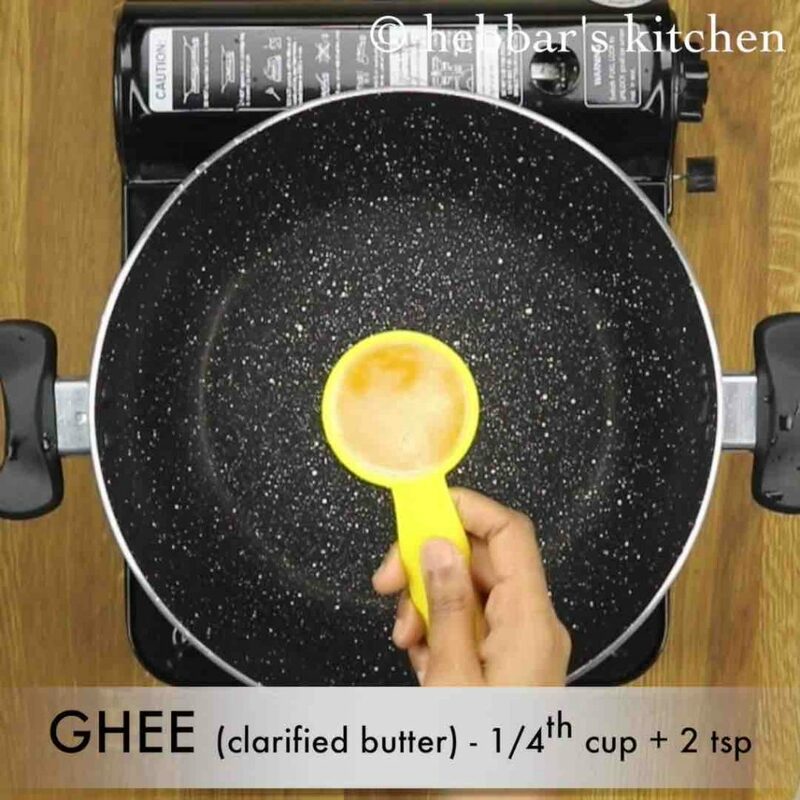 else just add ¼ cup ghee. once the ghee begins to melt, add besan. sieve besan if there lumps in it. and stir continuously keeping the flame on low. 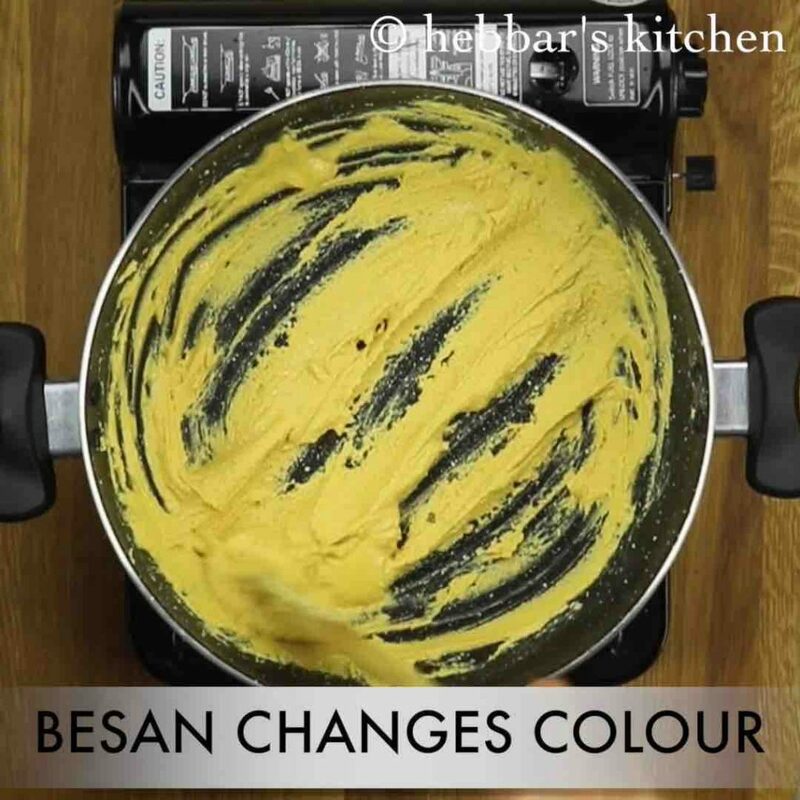 else the besan will change colour quickly but remains undercooked. 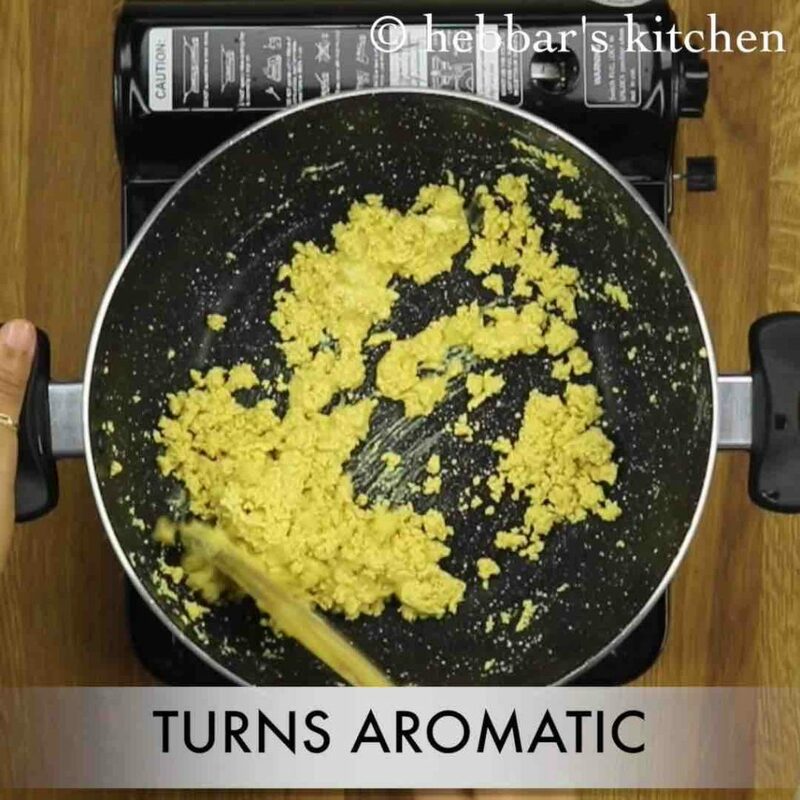 furthermore, notice the besan will start releasing ghee from sides of pan indicating the besan is well cooked. 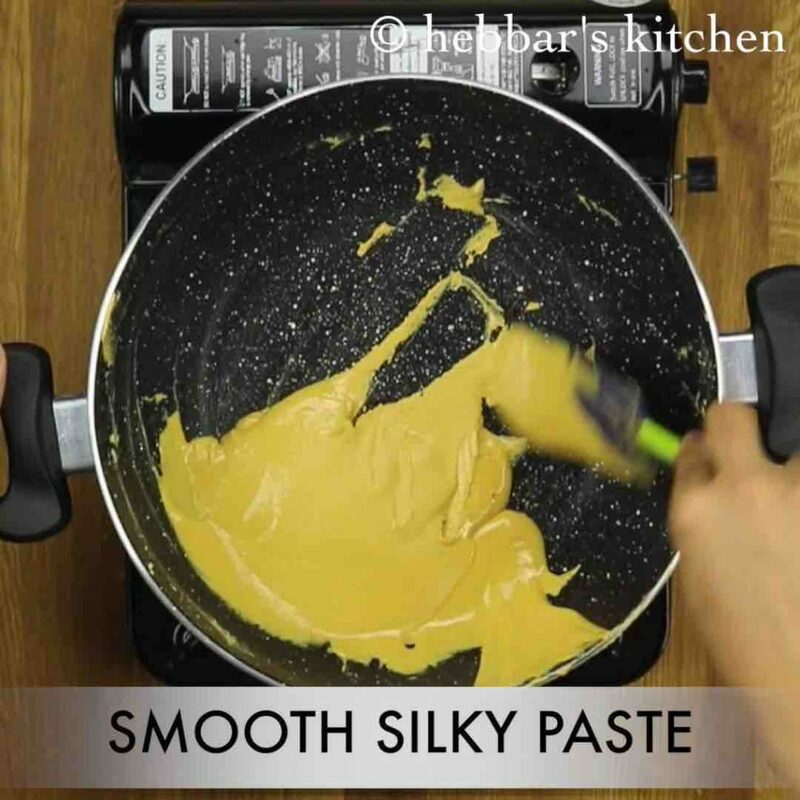 also the besan turns to silky smooth paste. 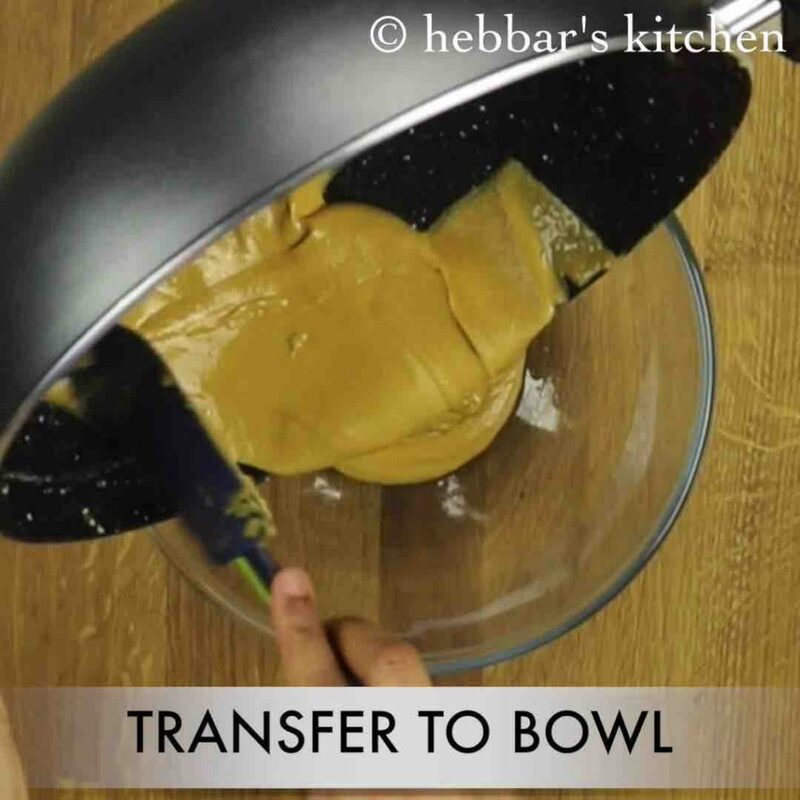 take off the flame and transfer the paste to a bowl preventing besan from further cooking. else besan ladoo will turn bitter. allow the besan paste to cool completely. takes approximately 30 minutes to come to room temperature. 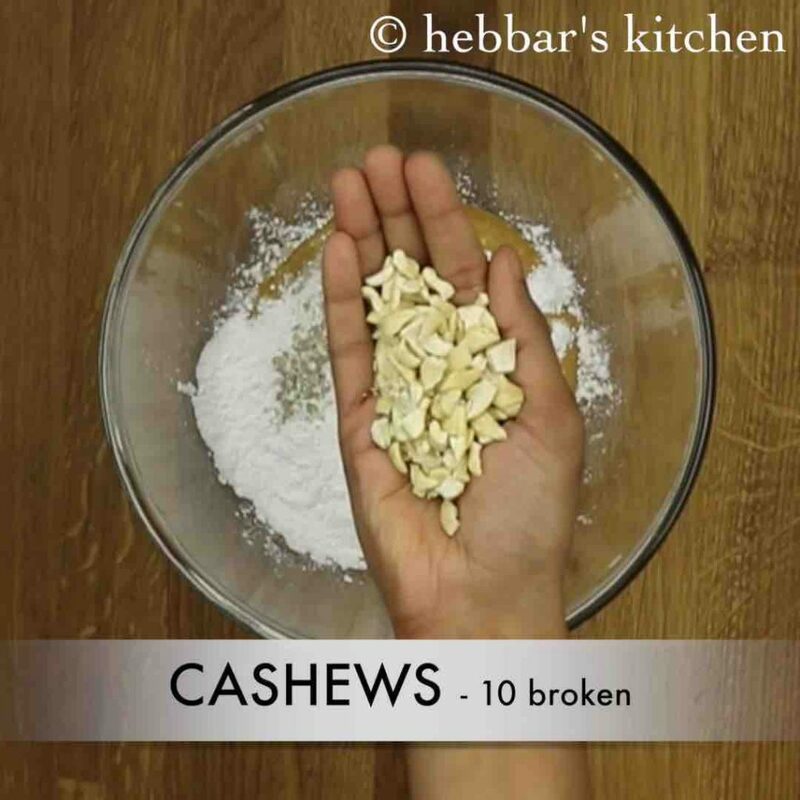 also add broken cashews or nuts of your choice. break the lumps and mix well. do not mix from hands as the temperature of your body will heat the besan and sugar, resulting in releasing ghee. 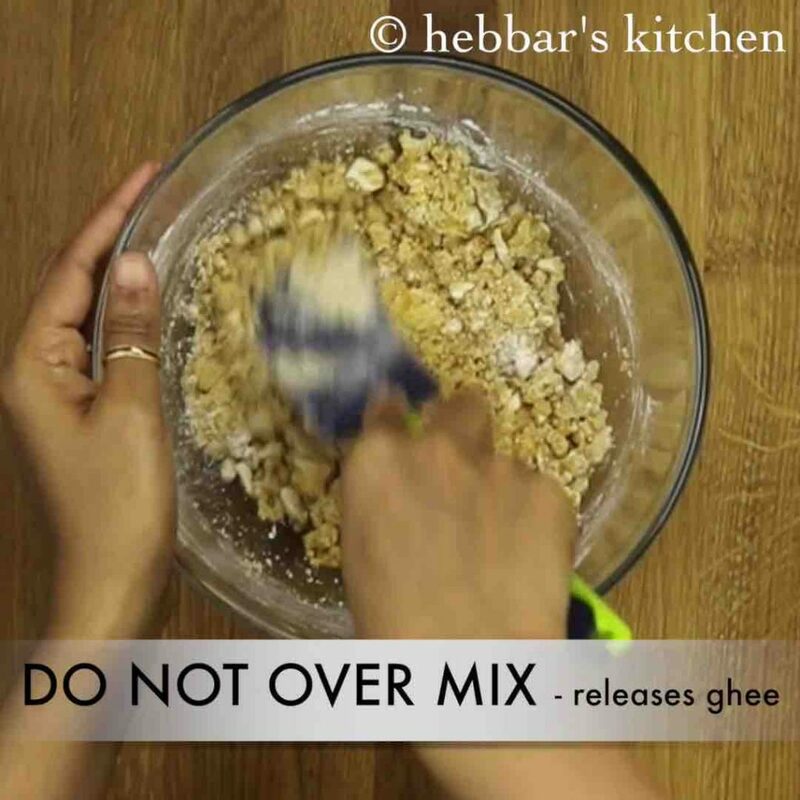 do not over mix as it releases ghee. make sure to have no cracks on ladoo. so grease your palms with ghee while making balls. 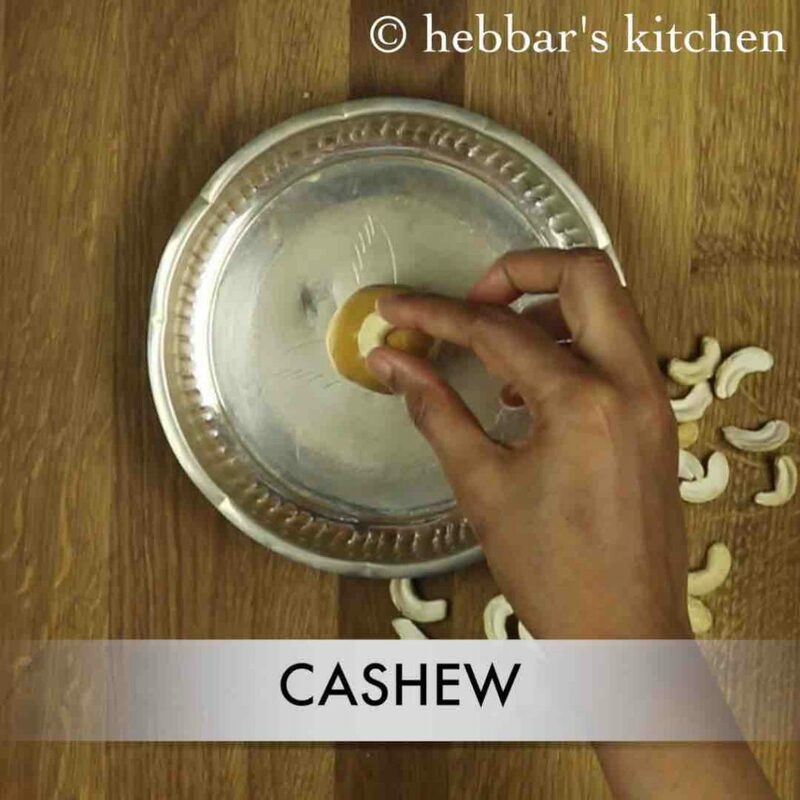 also garnish with cashew or nut of your choice. 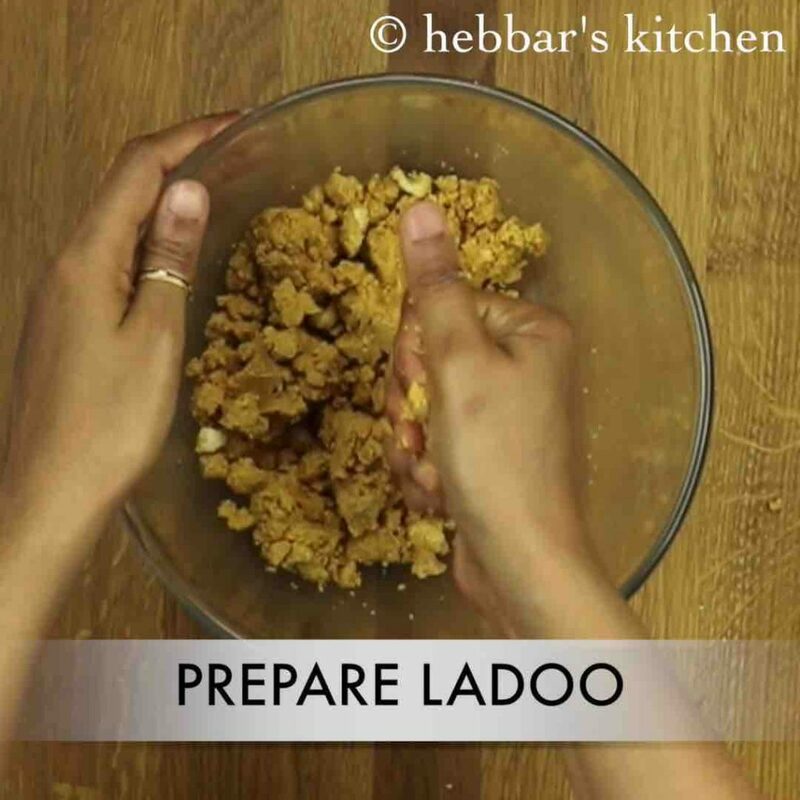 firstly, if you have difficulty in shaping ladoo, cover and refrigerate the mixture for 15 minutes to firm slightly. 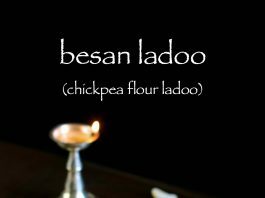 also besan ladoo stays fresh up-to two weeks at room temperature. furthermore, besan ke ladoo can also be prepared in microwave. check out the microwave besan ke ladoo recipe. additionally, use coarse besan or add a tbsp of semolina / bombay rava to get a crunchy texture. most noteworthy, do not add sugar when the besan paste is hot as it melts down the sugar, and turns watery paste. finally, increase the amount of sugar to ¾ cup if you are looking for very sweet besan ladoo. Whats is the shelf life of the ladoos? ladoo stays fresh up-to two weeks at room temperature. 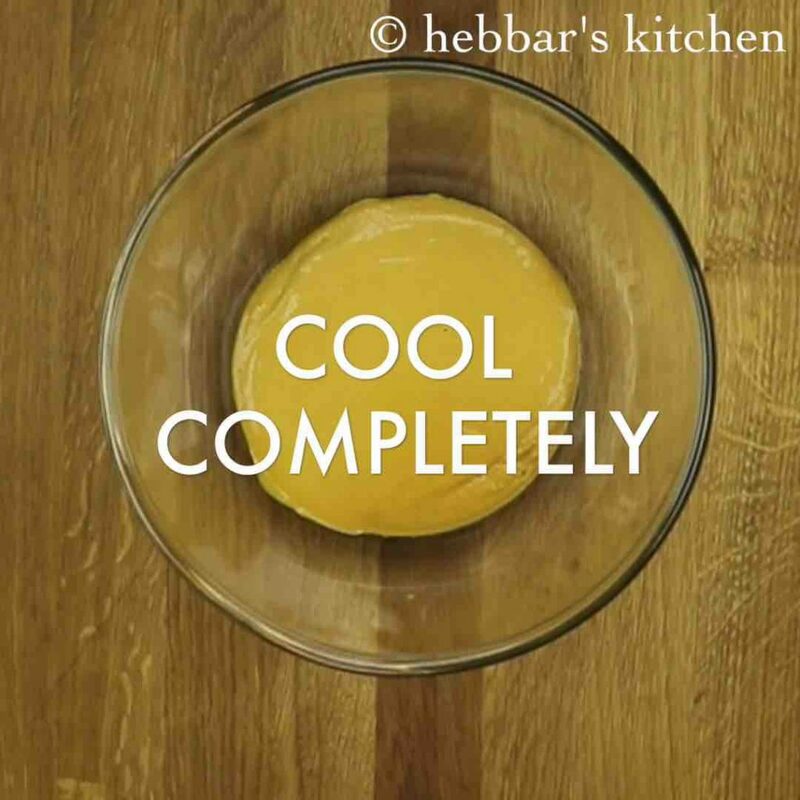 You have great recipes, thorough and easy instructions and the videos are perfect! I made these ladoos last year for a party and they were a super hit!! Thanks and keep up the great work! 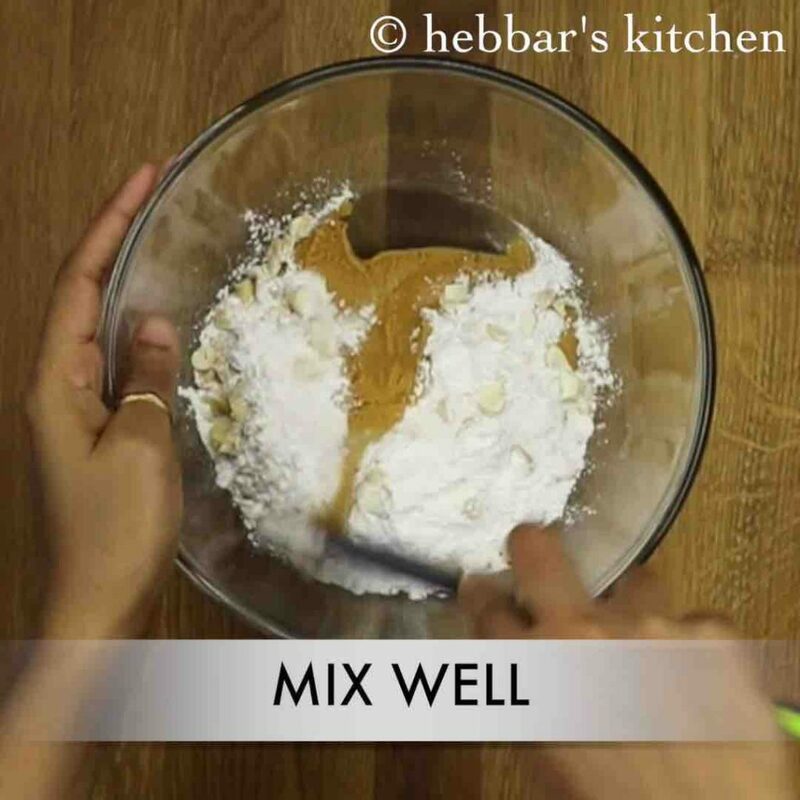 I tried this recipe on my birthday.it was so delicious .thanks to hebbar’s kitchen. I tried it on my birthday.it was so delicious…..thanks to hebbar’s kitchen. Hello sir, i tried this recipe for several times but it didn t come out gud ,besan was too crunchy just like granules,please help me,my children luv besan ladoos, Please let me know wat mistake i m doing. I hope u ll respond me. I had prepared this recipe for our wedding anniversary…it was so tasty…. 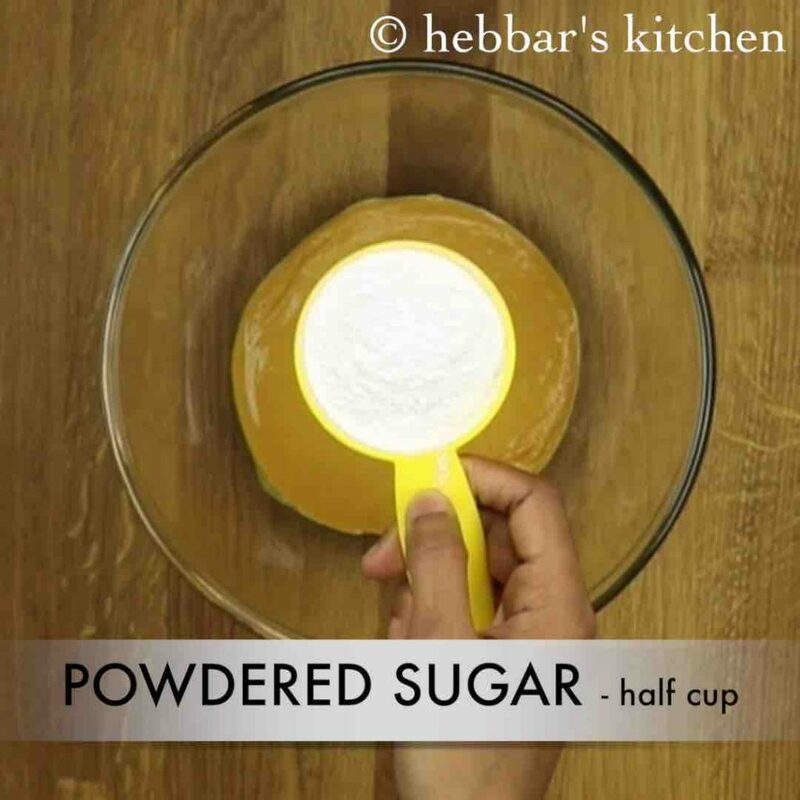 thanks hebbars kitchen…. Awesome… your cooking style has finally made me a cook.. 🙂 . Best is, the tips that you give.. And the recipes turn out to be the same way as it shown.. I tried making the ladoos twice and everyone liked it.. Thanks a lot Pk. I really appreciate those words.